Bella Vista is a historically Italian neighborhood in South Philadelphia that is bounded by South Street to the north, Washington Avenue to the south, Sixth Street to the east, and Eleventh Street to the west. The late 1800’s saw the settlement of the area by large numbers of Italian immigrants, effectively shaping the makeup of the neighborhood. The neighborhood was rebranded as “Bella Vista” in the 1970’s. The neighborhood is home to the Italian Market, a historic Philadelphia landmark. Bella Vista was recently ranked “Best Place to Live in Philadelphia” by Niche.com. Residents of Bella Vista can enjoy the diverse eateries and BYOB restaurants in the neighborhood and in nearby Passyunk Square. 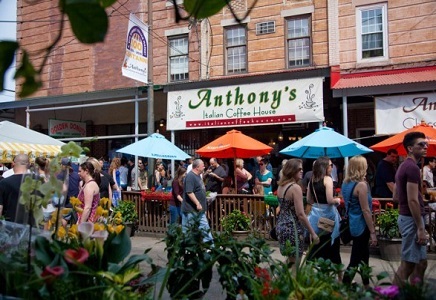 The neighborhood has a large concentration of Italian, Mexican, and Vietnamese eateries in the Italian Market and on Washington Avenue. The median sales price for homes in Bella Vista is currently $358,000 with a price per square foot of $287. The median rent per month is $1,825.